After nearly four weeks of daily highs over 100°, many over 110°, and a few as hot as 115°, Mother Nature could take no more. 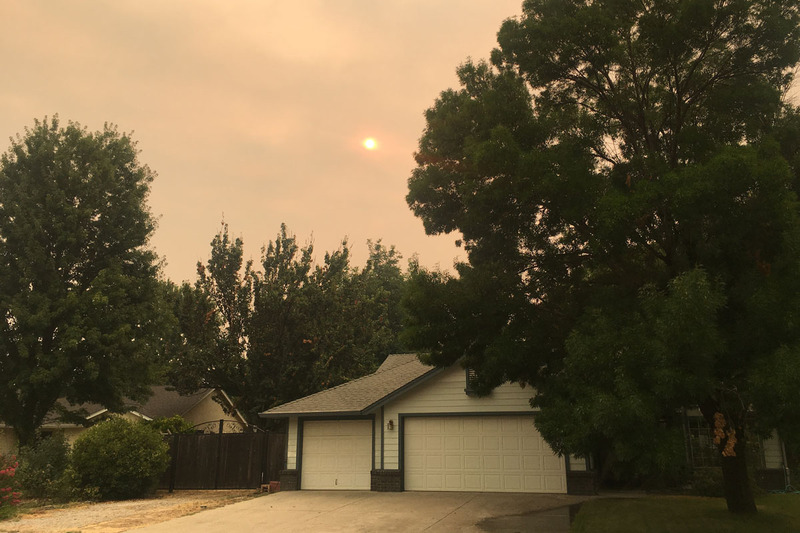 Monday afternoon, what has now come to be known as the Carr Fire burst into flame in a remote corner of far Northern California, known quaintly as “French Gulch,” about 15 miles west of Redding. The fire didn’t get much attention, at least from the media, until Wednesday or so when Redding began to fill with smoke. But even then, it wasn’t all that remarkable. Sadly, smoke-filled days are pretty common here in mid-to-late summer. Because it’s so hot and dry, it’s pretty easy to start a fire. People claim that mere sparks from a dragging chain, say on a boat trailer, can start a grass fire, which then grows quickly. I’m a little skeptical about sparking chains myself, but the grass is so dry that it could easily burn from a carelessly thrown cigarette, or by contact with a hot catalytic converter from an off-road driver. Or really from any little source of ignition. During the week, I had made plans to go to see friends in San Francisco, with a planned Friday departure. However, by Friday morning, the fire had grown to roughly 24,000 acres, and there was talk of evacuation in the air. Normally, I’d not give a second thought to danger from a wildfire. We live in a very suburban area, with houses on quarter-acre lots, surrounded by well-watered lawns and green trees. However, last year’s firestorm that destroyed Santa Rosa killed whatever complacency that I might have harbored about safety in the suburbs. What do do? After exhausting all the other possible choices, I decided to do the right thing and to stay here with my mother in case an evacuation was ordered. By noon, it was pretty clear that even here we were under threat. Ashes had been falling all night onto the property, and my mother’s car was pretty well speckled. Homes in northwest Redding had already burned, and the fire jumped the mighty Sacramento River. The fire was now 48,000 acres, or 75 square miles, or an area one-and-a-half times the size of either San Francisco or Boston. Though we don’t want to evacuate, it seems like a lesser evil compared to dying a fiery death. So we packed the car for evacuation. All the family photos are now in the back of my car, along with tools, an air mattress (God only know where we’d stay), and various other essential items. Fortunately the car is full of gasoline and ready to go. We’ve also both got suitcases packed, and our important documents are at hand. I made a video of each room in the house describing all of our possessions in case we would need to file an insurance claim. Hopefully we’ll never need that video, but it’s good to be prepared. 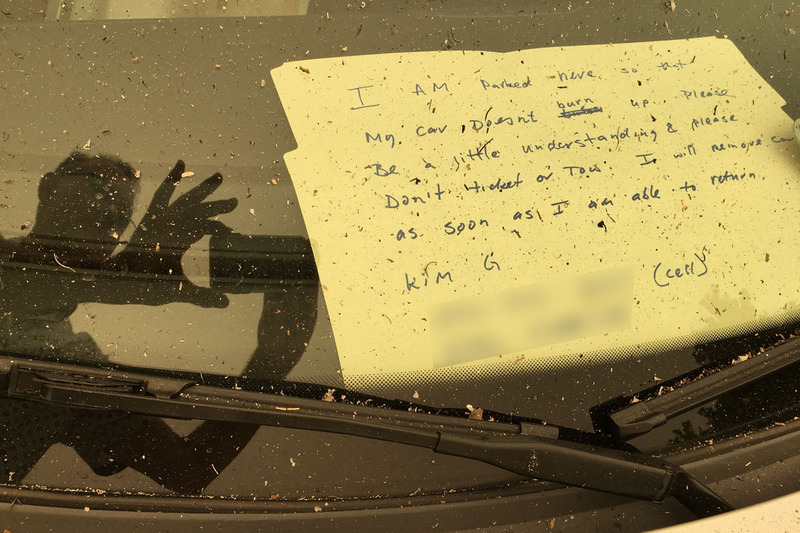 By about 2:30 pm, our neighbor’s son and wife were ordered to leave their house. They live about a mile and a half from us, across a good-sized four-lane state highway, which also has a railroad track running along it. That was pretty unnerving, but we told ourselves that Highway 273 would provide an effective firebreak. Neighbor’s son’s house is still not on fire, so we continue to hope. We are also in the uncomfortable position of having three cars, but only one driver. So we will have to leave two cars behind. One of them is my mother’s 2005 Mazda 6 wagon, which is, uh, politely speaking, not exactly a prime example of that model. And she’s no longer driving anyway. 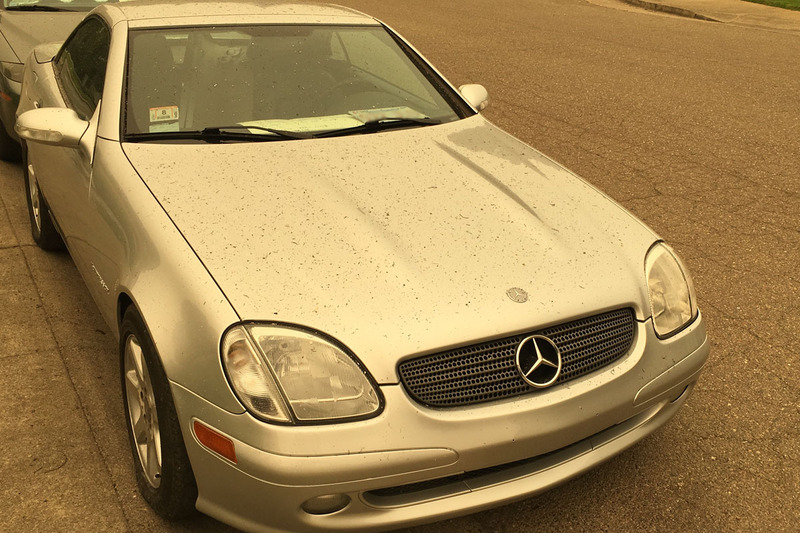 But the other car we’ll have to leave is my beloved Mercedes SLK, which I’ve recently put a ton of work into. Over the summer I’ve taken off and had repainted the fenders, and spruced up various other bits in a sort of “mid-life refresh.” So I thought hard and decided that I could park both of those cars somewhere in the neighborhood where there were few, if any trees. Fortunately, I found a spot down the street where the neighbor has gravel instead of a lawn (common here in this sun-parched area), and no trees. There, I figured, the cars might have a fighting chance. 18 Hours of Ash Fall. Weird orangy light is what it looks like here. After that, we just sat glued to the local news for the rest of the day. Unfortunately, it wasn’t very helpful. There were lots of interviews with people whose housed had burned down. While my heart goes out to these victims, such interviews aren’t really particularly helpful to the rest of us. I’d be much more interested in hearing how close the fire is. 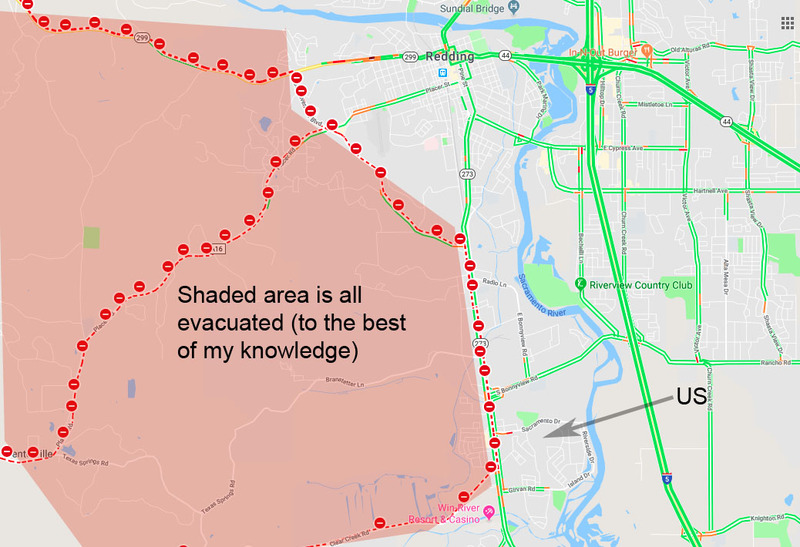 (CalFire only updates the map once a day). And I’d like someone to give some kind of odds as to whether we’ll really need to evacuate or not. At 4:00, CalFire gave a press conference that was so chock-full of bureaucratic platitudes that they were almost completely successful in not saying anything, despite talking for an hour. This morning, we awoke to a truly ridiculous amount of smoke. The sunrise was barely visible, and it looked like twilight outside until about 10:00 AM. By 1:00 PM, you could look up and stare directly at the sun without so much as either sunglasses or discomfort. The sunlight everywhere is oddly orange. 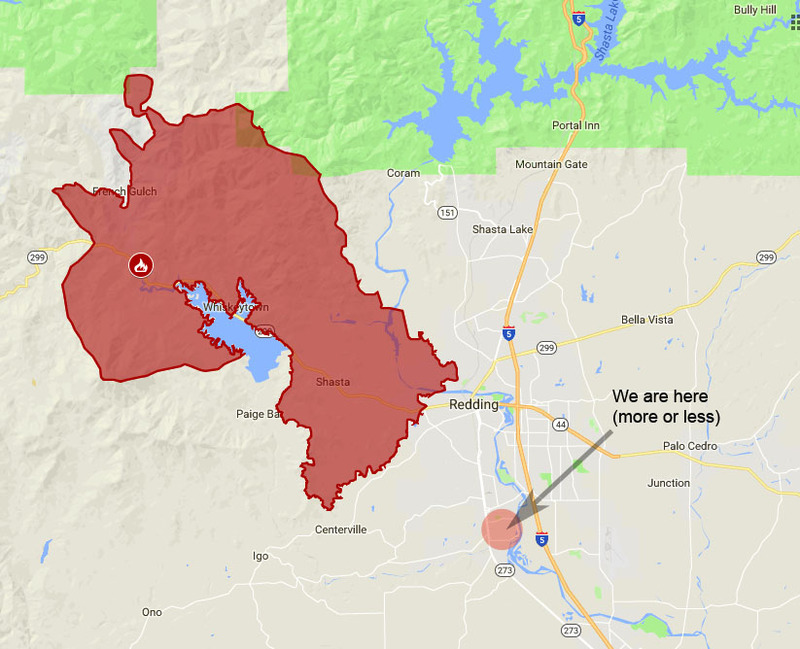 When CalFire updated their fire map, the fire had grown to 84,000 acres or 131 square miles, which is roughly an area 11.5 by 11.5 miles, a little more than a third of the area of New York City. Fortunately, the light winds had mostly died down. But the ash fall had increased. Now we had full-sized, charred leaves, pine needles, and other bits of debris landing in the yard. Meanwhile, every part of the area west of 273 has been evacuated. There’s a little strip mall on 273 that has a grocery store, car parts, dollar store, etc, and that’s now been closed. Gas stations are running out of gasoline. The good news is that the fire has not advanced far beyond the northern side of Placer Road, which is shown in the map below as the second dotted line from the top. And we continue to wait. I’ve decided that we will evacuate either if we lose electrical power, or if the police tell us to leave. Though it feels cooler than normal here due to the smoke, the official temperature is still 106°, and we can’t hold out long without a/c. For now, we are OK. We’re trying to keep smoke out of the house by entering through the garage. Stores are still open, and we are reasonably well-provisioned. But if my mother’s house burns down, we are going to go to Boston. After all, why live like a refugee in hot, dry California when you’ve got a perfectly good house in Boston? And while I don’t want my mother’s house to go, it’s a nerve-wracking place to live. During the spring of 2017 I worried we would be flooded by a swollen Sacramento River. Now I’m afraid that the house will go in a firestorm. Oh well, at least we don’t have to shovel snow. For now, we are OK. Pray for us. Please. I made a video on Thursday of the earlier stages of the fire and the smoke plume. It’s processing and I’ll upload it later. Thanks for reading. I pray for you guys and all the people there. Hola Tino! Yeah, we’re definitely close to the evacuated areas (< 1 mile), and about 5 miles to the southern edge of the fire. I'm hoping we're ok, but this fire is now huge and still growing. As for your question, I'm not sure what you mean about "Address never made public." The email you use to comment is never made public, certainly not by me. Also it doesn't even have to be a real email address. I don't care. But if you change it, then you go back to moderation until I approve the comment. Saludos and thanks for stopping by! Y un muy fuerte abrazo. It’s good that you are prepared for a speedy evacuation. Be safe! Hola Bill! Yeah, I hate that we might need to evacuate, but it’s better to be prepared. But it’s looking like the firefighters have made progress in slowing the progression of the fire. I just checked the CalFire page, and it looks like the fire only gained about 5,000 acres last night to sit currently at 89,000 acres. So we are here with fingers crossed. Saldos and thanks for checking in. Hola Ms. Shoes! Thank you! I’ll have to take a look at it. Saludos and thanks for stopping back again! Oh for pity sake, Gringo, go. Drive down here to Santa Rosa. Lightening doesn’t strike twice so you’ll be safe here. We can put you up for a few days. You won’t be the first. Haha…Christine! Thank you! Thank you! Your comment made me laugh, if nothing else. I TOTALLY appreciate the offer. We do have several friends or relatives in the Bay Area who are willing to put us up if push comes to flaming demise. But we’d rather stick it out here until either we’re told to leave, or the power stops. I’m going to delete your email from the comment. And FYI (to everyone), I can see the email address you all use. (And you don’t have to use a real email address either). Thanks and saludos. And a hug too!!! OMG, that’s kind of a gruesome counterpoint to Christine’s comment. After the poor chap got up the second time I just prayed that he wasn’t hit a third time. Jeeze!!! There’s a good chance it’s faked, tbh. I haven’t looked too hard into it. But whenever anyone mentions lightning striking twice, I can’t help but think of it. Those Santa Rosa fires were interesting. There’s quite the conspiracy theory about it, secret death ray weapons etc. I suspected there’d be a more rational explanation, and burning embers were my number one guess. I was wondering about the lightning video being faked, but the ground below the guy was charred too, a detail a faker might have omitted. Still, we’ve all seen spaceship battles in Star Wars, so video isn’t any more truthful a medium than print. As for Santa Rosa, I think it was pretty uncontroversially fed by high winds. PG&E (local utility) also apparently had some bad transformers that started/contributed to the fire. Jeez, man. I wish you and your mother well. The Mercedes too. Thanks! We’re just here waiting on tenterhooks, hoping that nothing will happen. But it’s a bit like The Pit and The Pendulum. Even taking a cocktail with dinner makes me worry that the cops will show up to tell us to leave just at the moment it’d be inopportune to drive. But we will probably be ok. Unless the wind picks up, and then all bets are off. Saludos and thanks for stopping by. How many signs from above will it take to convince you that it’s time to move to Mexico? Well, there’s no lack of desire on my part, really. It’s just the logistics of making it happen. Future posts will make this clearer. Saludos and thanks for stopping by. Kim,Stay safe. Good thoughts from over the mountains in Eureka. Hopefully the fire will spare your mom’s house and your SLK. Wow! Thank you! Unfortunately, the SLK may have to be sacrificed as it can’t carry me, my mom, our cat, mom’s walker, and everything else we need to flee. But it’s now parked in the safest spot it can be, and be near the house. So at this point we are just hoping and praying. Thanks for stopping by! Saludos! Kim, a pm was sent to your email. My heart is burning sadly with You and your Mom. Please evacuate! Don’t take any chances; You have spent the last year saving your mom’s life. It is destiny. Go to Boston. Thank goodness you have a safe home. It is calling to you both! Oh Kim! You and your mom have had such hard times!! Please let her know we are thing of you both here in Boston! Hi Penny! Thanks for stopping by. Yeah, it’s been kind of tough here. The fear and smoke are the worst of it. In terms of actual damage, we are fine. So far. Saludos and hugs. ¡Buena suerte! from this SF Bay Area gal currently living in Oaxaca, Mexico. I vividly remember the horror of smelling the smoke, seeing the cinders float all the way across the Bay, as the Oakland hills fire raged. Abrazos a los dos. Hola Spixl! Thanks for the kind words. Yeah, I remember the Oakland fire too. I wasn’t living there at the time, but I had flown back on business and saw it from the air. Very sad! And Amy Tan lost an unpublished novel in that fire. A loss to us all. Saludos and thanks for stopping by! My heart goes out to you and your mother. My elderly aunt and uncle were evacuated from Santa Rosa last year. We had planned to visit as we drove south from B.C. 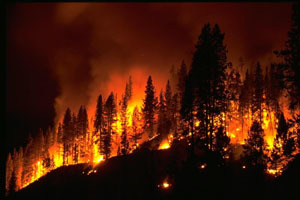 to Mexico in mid-October but by then Calistoga was ablaze and no word as to if or when the fires could be controlled. As you say, the uncertainty simply makes it worse. We have no active fires in mid-Vancouver Island now, but very limited visibility with smoke from fires on the mainland, hundreds of kilometres away. Wow, I’m so sorry to hear your Aunt and Uncle were caught up in the Santa Rosa inferno. That fire really made people realize that you’re probably only safe in the largest, concrete-jungle kinds of cities in California. Fortunately, here there’s little wind, though near the fire, it’s creating its own wind. Saludos and thanks for stopping by!